An EU-funded project that aims to reduce the carbon footprint of rail infrastructure has developed a tool that calculates the carbon footprint of railway construction. The footprint calculator, created by the LIFE HUELLAS project, uses a series of environmental impact and social indicators. It will enable railway construction companies to combine environmental, economic and social analysis to enhance the sustainability of their activities. The tool is based on Multi-Objective Evolutive Algorithms. Evolutive Algorithms are adaptive methods generally used in problems related to searching for parameters and optimisation, and which are based on the principle of ‘survival of the fittest’. Fundacion CARTIF leads the LIFE HUELLAS project consortium in partnership with the VIAS Y CONSTRUCCIONES, IK-Ingeniería, and the University of Granada. The project aims to reduce the carbon and water footprint of rail infrastructure by 10 per cent and 5 per cent, respectively, by developing decision-making tools and methodologies for use during railway construction. The project is reviewing and analysing the environmental and social impacts of every stage in the construction process, using Life Cycle Analysis and Social LCA techniques. For more information,visit life-huellas.eu (opens pdf, 11.7 MB). 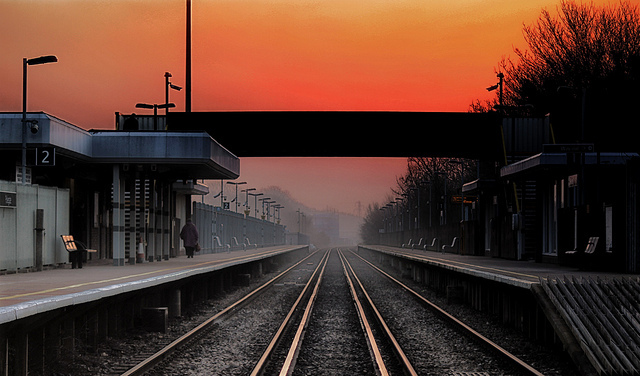 Image copyright: Polegate Station (image on Flickr) by "lee roberts", licensed under CC BY-SA 2.0.